这个人声乐团以演奏15~16世纪的作品为主,这一张专辑里Cappella Pratensis演唱了他们最为拿手的作品,分别是15世纪最伟大的安魂曲(Johannes Ockeghem的作品),以及16世纪最伟大的安魂曲(Pierre de La Rue的作品). The two settings of the Catholic requiem mass recorded here are the earliest polyphonic versions to survive; an earlier version by Dufay was lost. Both masses are appropriately somber. There is some question about the authenticity and completeness of Ockeghem's Requiem, described in the annotations for this Dutch release, but most of the music is unmistakably Ockeghem's, with fearsomely independent lines with spiky rhythmic diminutions appearing out of nowhere, considerable contrapuntal complexity in spots, and a certain stark quality. It uses the paraphrase technique, borrowing melodies from requiem chants and expanding on them in a polyphonic texture. The Requiem by Pierre de la Rue, a generation younger, is a good deal more regular, with points of imitation and an orderly addition and subtraction of voices generally. 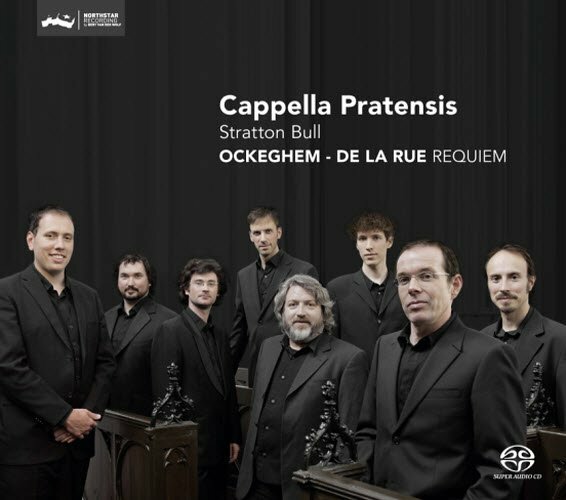 Parts of it are written in a very low register, and both this and the sinewy counterpoint of Ockeghem's mass are nicely brought out by the performance of the Dutch group Cappella Pratensis, with its eight male voices, all adults. 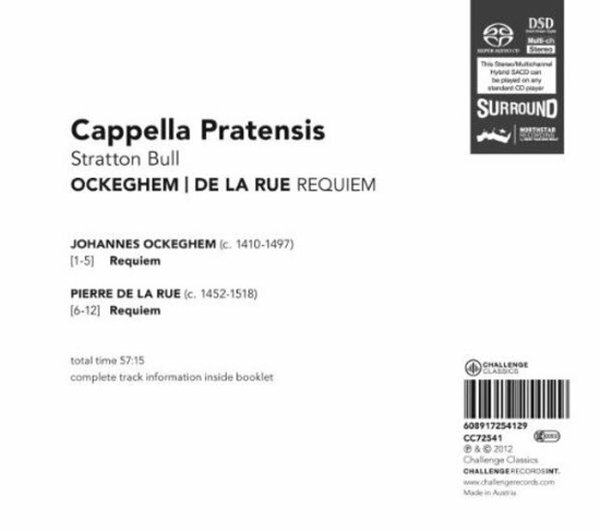 There's no question that the English cathedral style can have wonderful results in a cappella Renaissance choral music, even in that of the Fleming Josquin, but somehow the more muscular approach works very well indeed for these particular works. Another attraction is the fine Super Audio sound from the Dutch label Challenge, achieved in the perfectly suitable Church of Vieusart in Belgium. Strongly recommended. SACD DSD layer: stereo + surround 5.1 mixes.